We have just rolled our new TLS encryption feature to all users. TLS encrypts the outgoing email if the recieving server supports TLS encryption. What our system does when doing the SMTP connection we issue a command to check if TLS is supported if so we then connect via TLS and send the message encrypted. Here is an example message sent to gmail with no TLS encryption. You can see there is red unlocked lock displayed. Along with a message saying the no encryption was to encrypt the message. Now in terms of email delivery at the moment does not seem to be a factor. 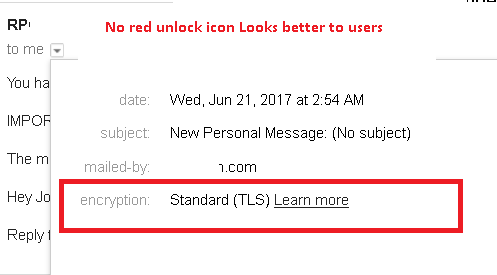 But places like gmail may consider emails that have TLS as having better reputation.